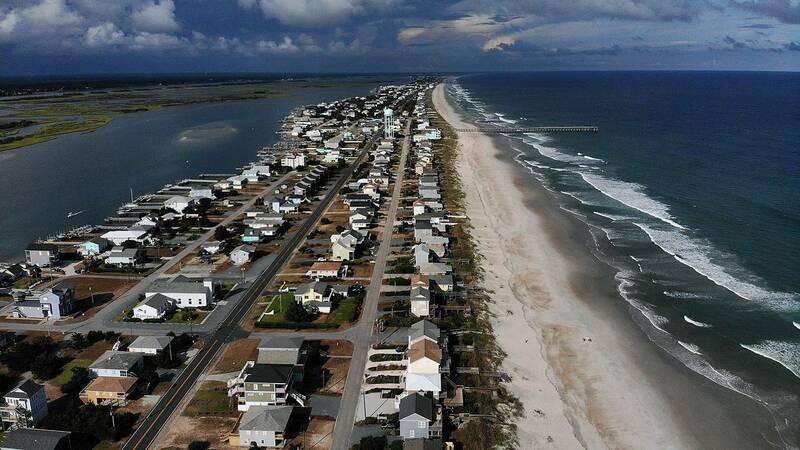 Homes along the coast in Topsail Beach, North Carolina, are evacuated before Hurricane Florence on Sept. 11, 2018. ORLANDO, Fla. - As Florence, now a Category 2 hurricane, moves toward the Carolinas, the tropical monster will bring drier air to Central Florida. At 11 p.m. Wednesday, the storm was centered 280 miles east-southeast of Wilmington, North Carolina, moving at 17 mph. When, where do storms form during hurricane season? Some computer models show Florence striking the coast late Thursday or early Friday as a Category 1 or 2 storm. The hurricane then may head inland due west. "It will stay over that region for several days, dumping possibly up to 30 inches of rain," News 6 meteorologist Troy Bridges said. "They will have flooding after having to deal with the storm surge and any wind damage." Drier air will work into Central Florida as Florence makes landfall. There's a 30 percent coverage of rain in the Orlando area on Wednesday and a 20 percent chance on Thursday and Friday. Expect a high of 90 on Wednesday and 93 on Thursday and Friday. "Our issues from Florence, other than lower rain chances, will be strong rip currents and seas up to 10 feet off the coast by the end of the week," Bridges said. Two people have died and two others have been injured in the rough surf off Central Florida since Sunday. One man died rescuing a 10-year-old boy off Playalinda Beach. The other was found dead off Volusia County. An area of low pressure producing showers and thunderstorms near the Yucatán Peninsula has a 70 percent chance of further development over the next five days as it moves into the Gulf of Mexico. "This system will continue to move into the western Gulf and trek toward Texas," Bridges said. "It is not expected to impact Florida." The next named storm will be called Joyce. Meanwhile, Tropical Storm Isaac continues on a path west with 65 mph winds. The storm is about 500 miles east of Martinique and is moving at 16 mph. Some computer models take Isaac up to Hispaniola, where mountains could tear it apart. A couple of other models bring Isaac to Cuba, where it could also die out. "If it holds together, we will have to watch Isaac," Bridges said. Helene is 800 miles west-northwest of the Cabo Verde Islands. "She will turn to the north and not impact land at all," Bridges said. Subtropical Storm Joyce formed in the northern Atlantic Wednesday, becoming the fourth named storm currently in the Atlantic. It is expected to stay out to sea, however. The next named storm will be called Kirk. If there were to be five named storms in the Atlantic at the same time, it would be the first time in recorded history.